It was about a month into the 16-year-old goaltender’s first season with the Western Hockey League (WHL) club when Davidson called the teenager into his office for a chat. The conversation between the decorated hockey architect and the young kid wasn’t an uncomfortable one for either. In fact, it was quite the opposite. For Davidson, it was a chance to catch up with Hart, to make sure everything was going smoothly, on and off the ice, for the native of Sherwood Park, Alberta. Hart’s words were said with conviction, not cockiness. After 18 wins from 30 starts in his rookie WHL campaign, Hart followed it up with a 35-win season in 2015-16, earning Canadian Hockey League Goaltender of the Year honours. Hart, selected 48th overall by the Philadelphia Flyers in the 2016 Entry Draft, was named both the WHL Player of the Year and Goalie of the Year the following season after he posted a 1.60 GAA, a .947 save percentage and seven shutouts. In addition to being selected WHL Goalie of the Year in 2017-18, he was also named Canadian Hockey League (CHL) Goaltender of the Year for the second time, the first goaltender in CHL history to receive the award twice. And as Davidson found out in another conversation with Hart, staying put in Everett was top of mind for the backstopper. Hart, who won gold with Team Canada at the World Juniors in 2018 (he also earned a silver in 2017), finished his WHL career with a record of 116-49-19 and 26 shutouts. This past December 18, Hart made his NHL debut, a 3-2 win over Detroit. He earned First Star honours for the performance. Connor Parkkila, a young and early fan of Hart as a goalie for the Silvertips, would get a ceremonial fist bump from No. 79 ahead of each game. Hart actually wore No. 70 in Everett, and was assigned No. 79 during a development camp for the Flyers in 2016. Connor's parents, Aprili and Will, purchased accordingly. Once Hart saw Connor donning the No. 79 Flyers jersey with his name on the back, he knew he would be sticking to it. Hart sealed the decision by gifting a special Stadium Series jersey, and hosted the family at the 2019 Stadium Series game between the Flyers and Pittsburgh Penguins. 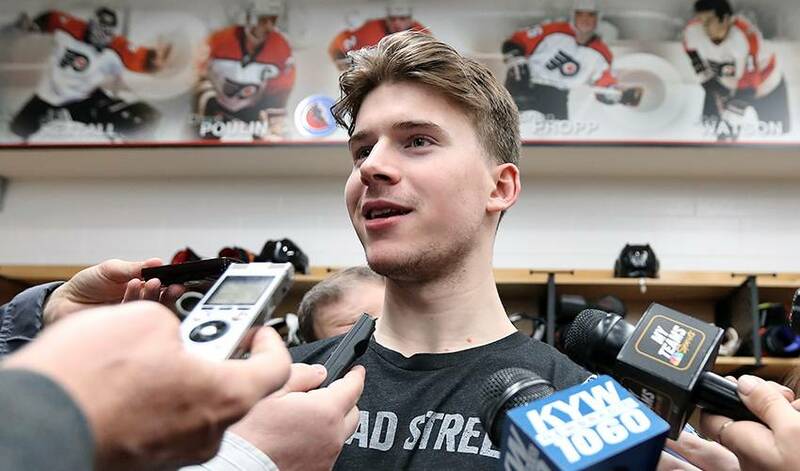 "When I came back to Everett, Connor was there waiting for me like he usually did and was yelling at me trying to show me his new jersey," Hart told Philly Voice in August. "He had a Flyers jersey with Hart No. 79 on the back. When I saw that I decided I had to stick with No. 79 because there was a No. 79 out there. ... I couldn't change the jersey number now. I didn't think Connor would have been too happy if I had the wrong jersey with the wrong number on the back." Hart sealed the decision by gifting a special Stadium Series jersey, and hosted the family at the game.